For my latest necklace, named Kokoro, the main inspiration were the Japanese millefiori beads, in delicate porcelain. Kokoro is a Japanese word that means "heart", but not the physical heart (named Shinzou). 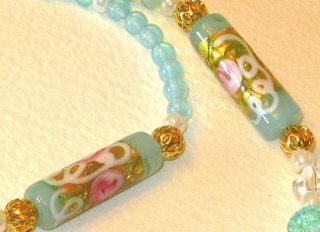 The hear Kokoro designates is a spiritual one: spirit, mind, essence, thoughts, emotions, feelings, the heart you use to "love" someone, to cherish for something. 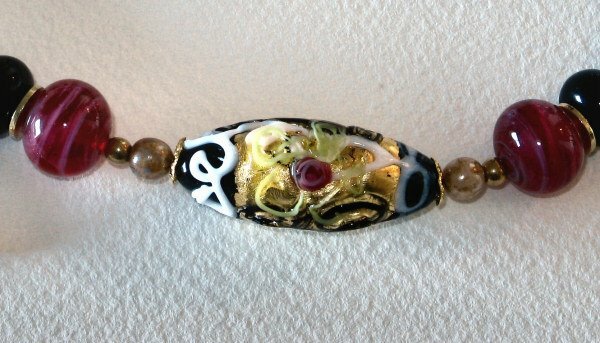 An abstract, poetic concept, meaning roughly "the spirit! or "the essence" of things. - Antiqued gold-plated clasps in the shape of a flower. 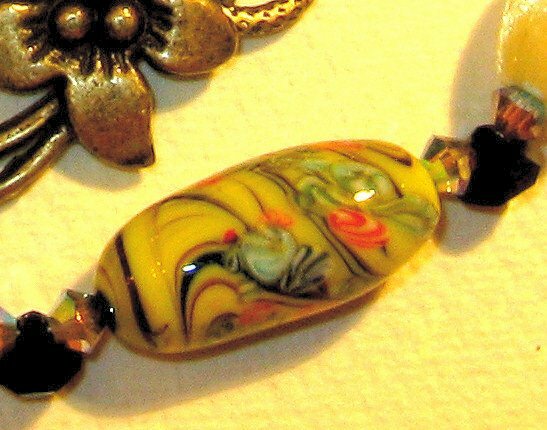 One of the Japanese millefori beads, in yellow porcelain with colourful swirls and flower patterns. 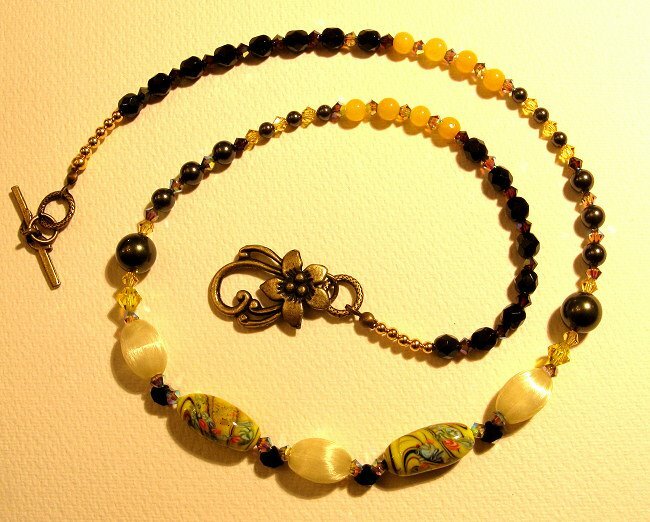 Main colours are yellow and black, thus my choice of the crystals, pearls and jade. One of the silk beads I used, surrounded by light topaz Swarovski bicones and Swarovski black pearls. 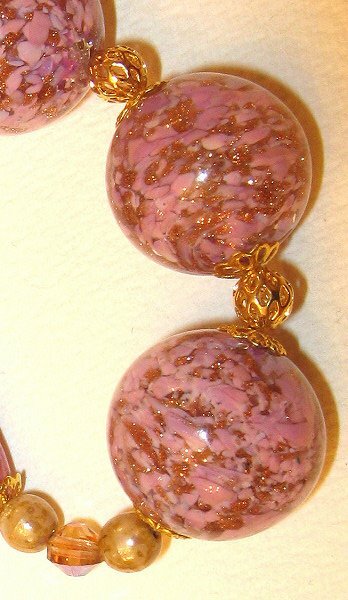 Well, yesterday I made some earrings for some of the necklaces. It was a bit hard, I must say I much prefer threading 100 necklaces than making one earring. But hey, what's life without a little challenge now and then? 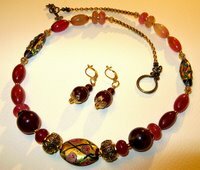 I am going to show a picture of the necklace and another of the earring in a close-up. The thumbnails below are smaller than usual, so, you should (as ever) click on the picture to see it real-size. I used one opal, 1 cream Swarovski pearl, one tiny gold-plated ball and gold-plated earring bases. For that one I used Indian wedding cake barrel beads, Swarovski bicone at the top, and to finalise a small gold-plated ball and gold-plated earring base. Again, Indian wedding cake amethyst beads, antique gold spacers at the top and a gold-plated ball to finalise. The base is also gold-plated. Used Indian wedding cake beads, pink faux pearls and silver plated-plated ball and bead caps, in a stainless steel (surgical type) earring base. 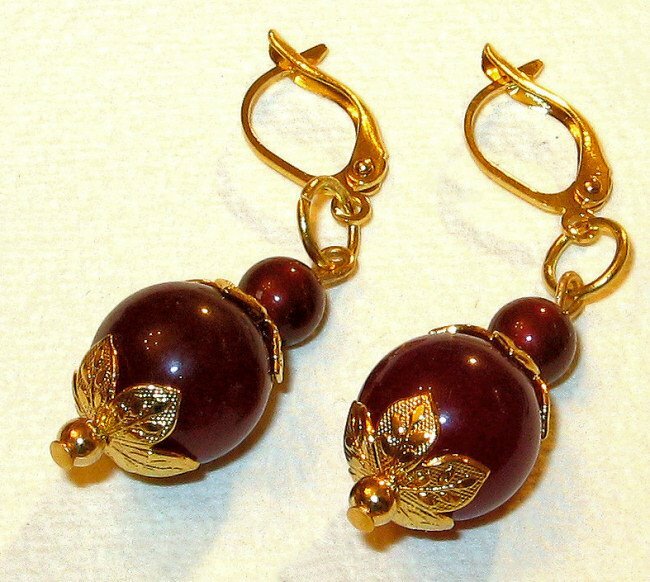 I liked this earring the best maybe. 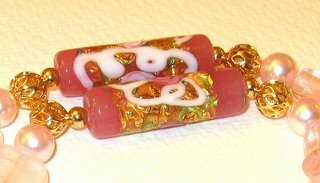 Used 2 cherry jade beads surrounded by gold-plated flower bead caps, finalising with a burgundy Swarovski pearl at the top and the usual gold-plated ball. 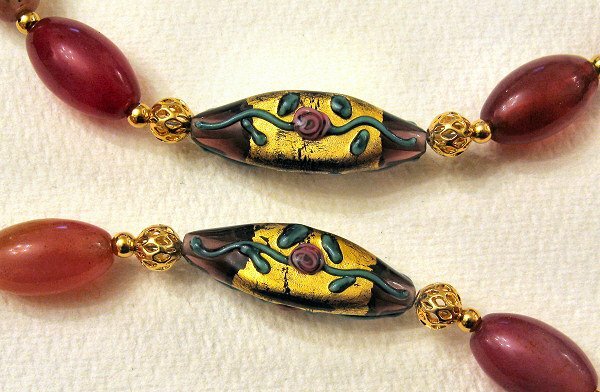 As before, a gold-plated earring base keeps it all together. 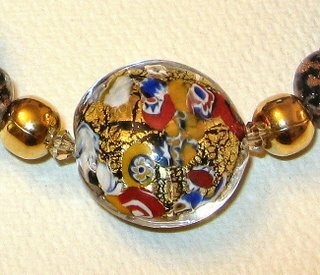 For Sol Niger it was simple: 2 Swarovski golden shadow bicones, one gold-plated ball at the top, a gold-foil Murano bead and base as before. The Positano Blú was my third necklace on that "productive" day. I called it Positano Blú due to the memories I have from that Italian town. 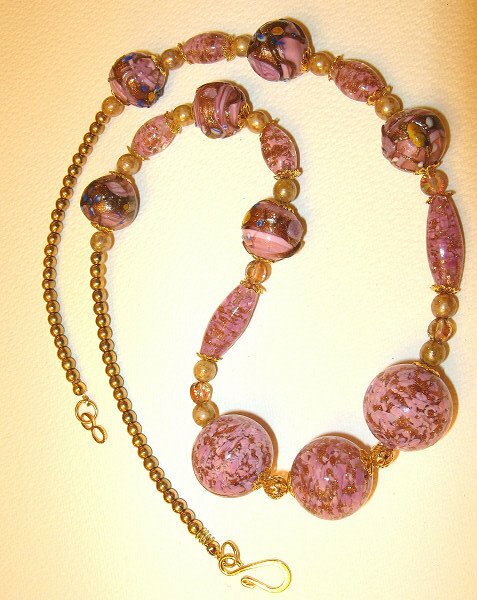 The beads make me think about our very brief visit to Positano. High up in the hills on the Amalfi coast, a very narrow and winding road, and lots of flowers, old houses and lovely boutiques. The sunny day would hit those stones and the pavements, after a drizzle. Wet and shyly sunny it was on that day. Then, I got a perfume from the Le Sirenuse line from Positano: the Eau d'Italie. It quickly became one of my favourites. And, again, a smell of lemons, wet grass and the sun hitting the stones - like after a day in the beach. 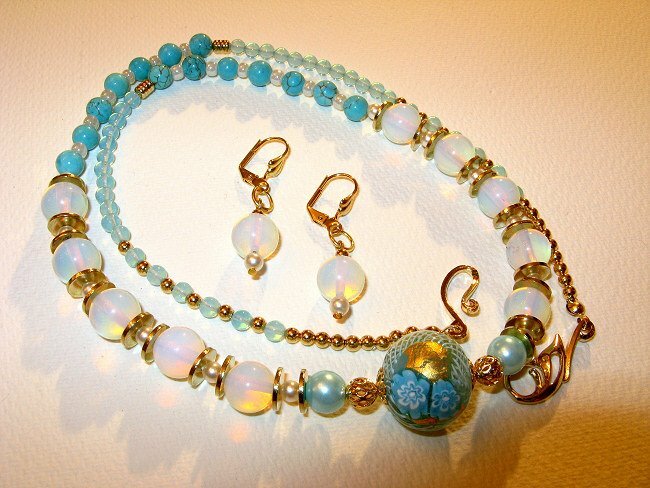 - Opalite tiny beads with Czech glass seed pearls. 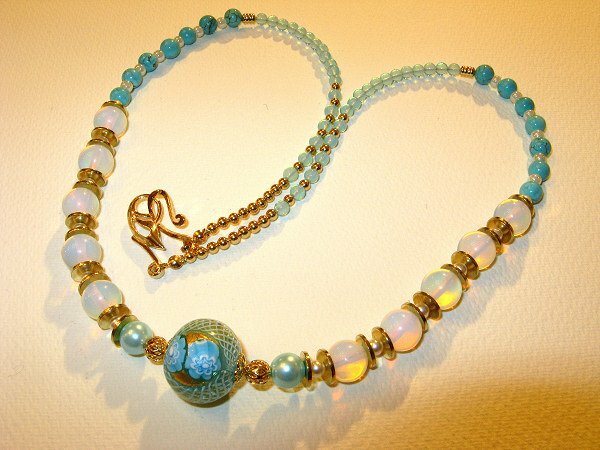 Here you can see the focal bead in detail, a lovely Millefioriwith blue and white lacy pattern and 24k gold foil, surrounded by filgree gold-plated caps and spacers, and the Swarovski blue pearls. 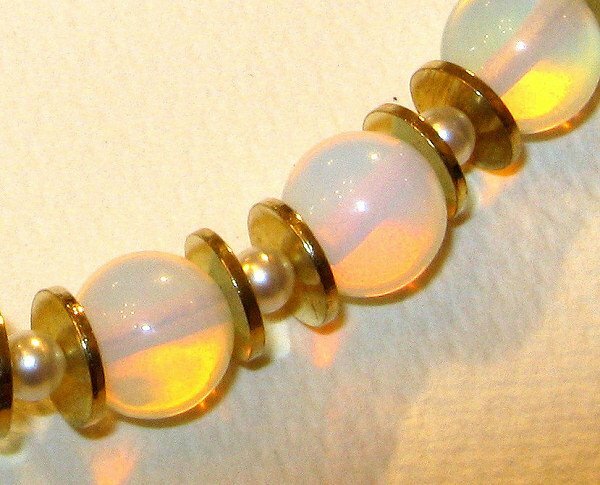 The above picture shows the fire opals, which clearly make me think of my Eau d'Italie cologne and the sun. If it had a smell, that would be it, lemons, sun and stones in a wonderful Italian village. 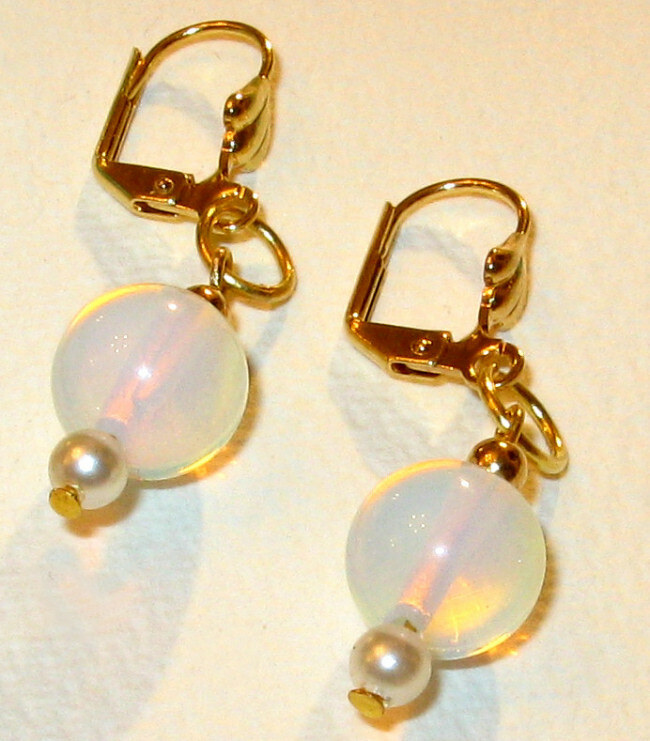 You can also see the gold-plated spacers and the creamy Swarovski pearls in the middle. Turquoise beads with black veins, tiny Czech pearl seed beads and opalites. 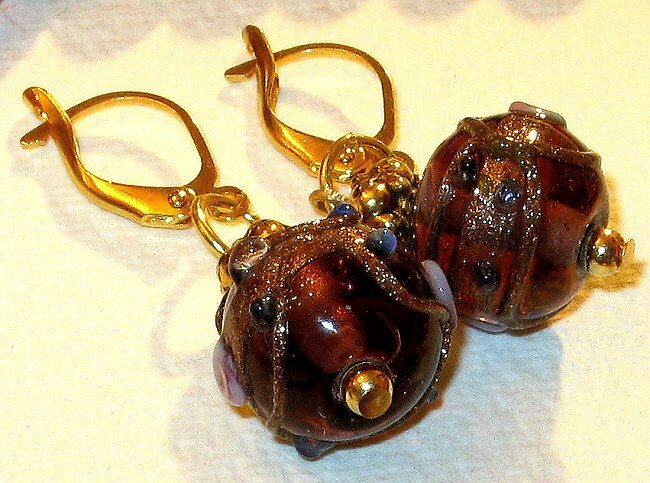 - which are a real pain to work with due to the extremely diminutive size of the holes. I am running out of these already though! 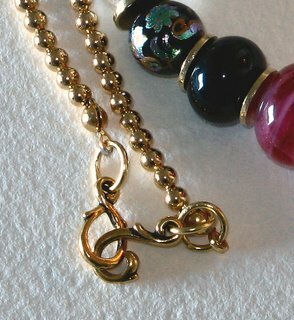 And a final shot of the clasp, tip and tiny balls, all gold-plated. 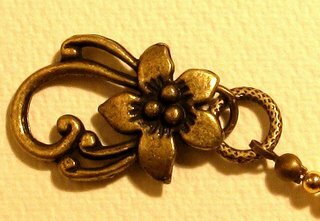 I really like the design of that clasp, it's very sleek in a nice art-nouveau revival way. Easy to use as well, because it's quite big. Fpr some reason, the camera did not manage to capture the shade as is. 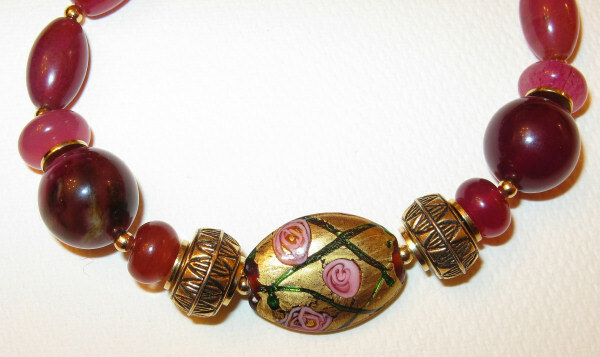 Rather than a cherry red, I would say it is an Antiqued Rose hue. Colours are cooler in real life than they appear in the pictures. 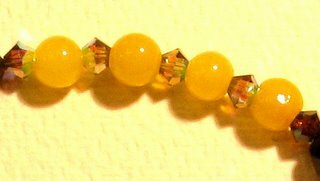 - Silver-lined Czech seed beads. The design follows the scheme of Violeta and Violeta2, roughly. 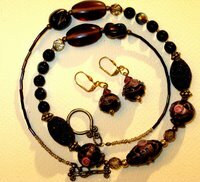 For these 3 necklaces the Indian beads are the main characters. 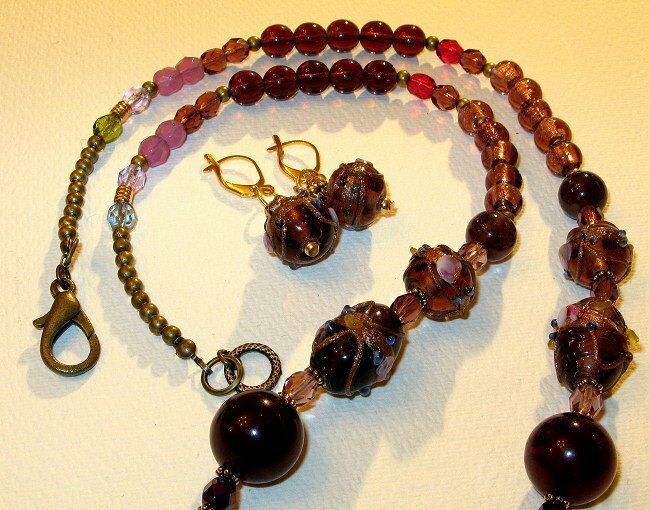 The above picture shows the main Indian bead, which is in the centre of the necklace, as well as some of the silver-plated bead caps and spacers and the Czech seed beads - used as separators. 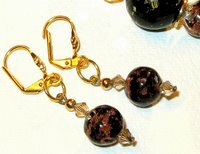 You can also see a bit of the clasp, which is quite pretty and good to use (small hooks). 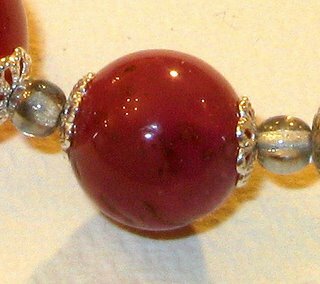 Finally, the above photo shows one of the cherry jade beads (measuring about 15mm for the bigger ones, and 10mm for the smaller), silver-plated bead caps and silver-lined Czech seeds. Yesterday was a productive day, necklace-wise, I mean. I made 3. As always, it's great fun. I seriously still don't know very well what I am going to do with them, but I keep doing it. Yes, I would like to sell them. Just not quite sure how and where to start. Violeta2 has warmer shades of purples, whereas its predecessor was more in the cool side. 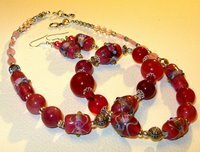 On this one I have used: Indian wedding cake beads, plum jade, Swarovski burgundy crystal pearls, Murano and Chinese foil beads, Czech crystal beads and antique gold and gold plated spacers and clasp. 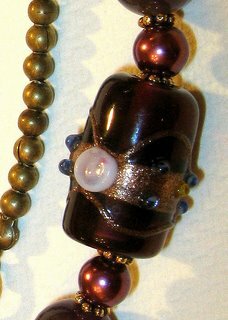 And last, but not least, 4 natural Amethyst chunky beads surrounding the main tubular bead. The Indian Wedding Cakes in shades of deep plum. They are quite irregular in their colouring, thus, quite unique. They have copper-goldish foil. You can also see some of the small Czech beads and spacers. On this picture, you can see the main bead and the Swarovski pearls. Tomorrow I will post some pictures of the other two necklaces. I made this necklace today. It's dark, but with some speckles of gold to it. I named it Sol Niger or "Black Sun", an alchemical term that represents the results of the Opus Magnum's first stage, the Nigredo, or blackness, darkness. Ruled by Saturn, it also means decomposition, putrefaction, whereas everything that lives has to eventually die and give birth to a new stage (Albedo). New life arises from this melancholy process. 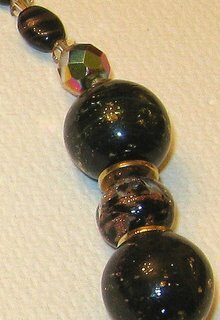 The focal bead represents the inner fire, the inner, occult sun, and the crystals (black and clear) are both the prime matter and the result itself of the alchemical process - the Gold, and the promise of rebirth, which culminates in the last stage: the Rubedo. 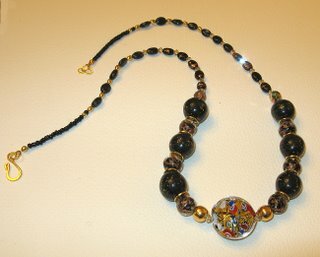 I made this to remind a phase of my life, where I was into Alchemy and all sorts of "magic". It was magic. Even if I am not into it right now, it played a major role in my life one day and I am grateful for that. - 2 small Czech fire beads. The Murano focal bead, a microcosmic Black Sun, surrounded by Sawrovski bicones (Gol Shadow, a very appropriate name!) and two gold-plated balls. I love the way the flash is reflecting in the bicone here, it looks very pretty. 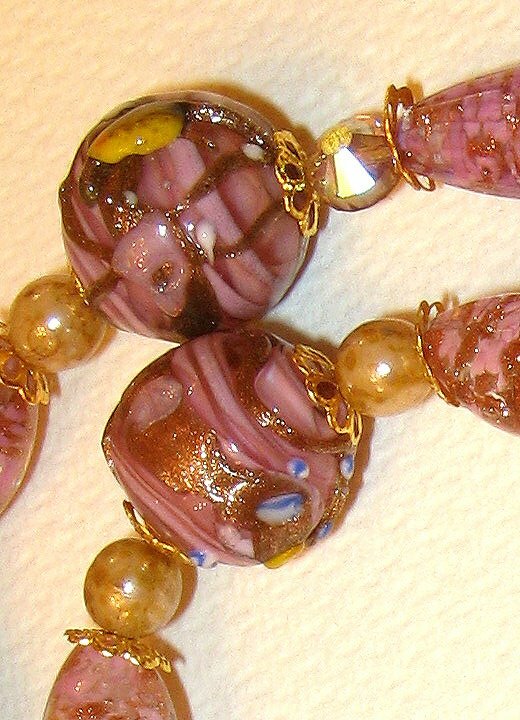 You can also see the small gold-foiled Murano beads. 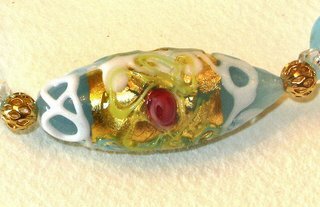 Finally, a detail of the dichroic beads, one Murano in-between and a Czech Fire above. I made another necklace today and called it Byzantium. I have used 3 Czech wedding cake beads (being one focal), gold-plated spacers, Czech glass golden balls and gold-plated oval small beads, and the most special gemstones: 2 dragon veins round, smooth beads and all the rest in shades of pink/burgundy jade. It is called Byzantium because of its crimson and gold, almost solemn shades - perhaps smelling a bit like old churches and incense - and the use of Chinese beads (jade and dragon veins agate). 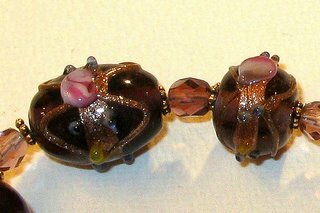 These beads allude to the Silk Road, and the role played by Byzantium as the rendez-vous for the merchants on their way to the East, searching for spices, silk, precious resins, gemstones, and so forth. 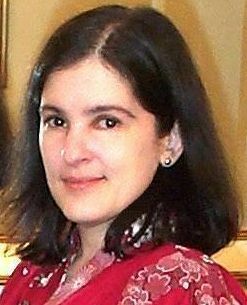 It tries to symbolically link East and West, or at least the idea I used to have about Constantinople, the Silk Road, and its heritage of churches, gold, stained glass and History. Czech focal bead, 2 spacers (plastic with bronze effect! 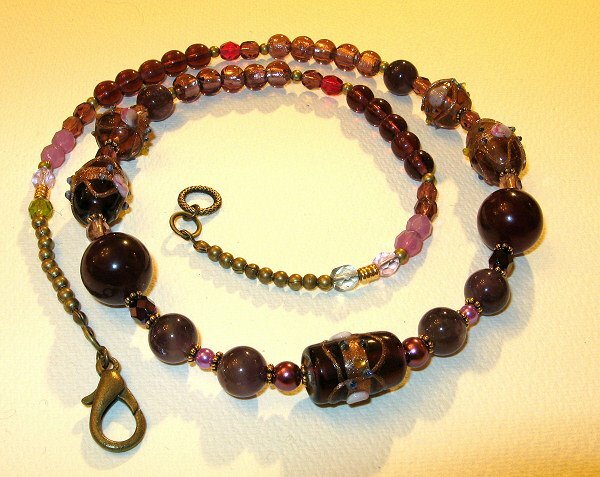 ), gold-plated thin spacers, 2 small cherry jade rondelle beads and the 2 chunky, heavy dragon veins (dark burgundy). 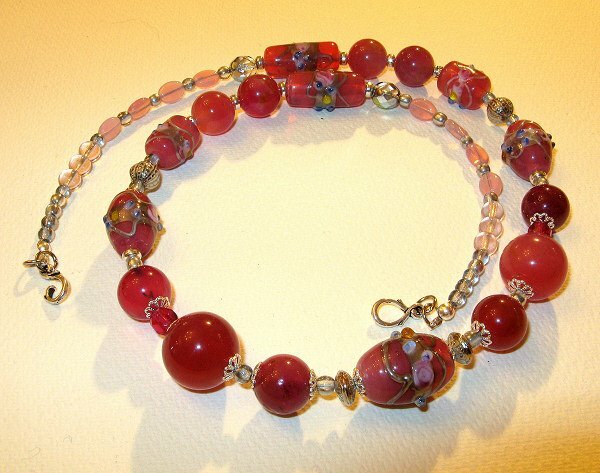 The remaining beads are the rose, cherry jade ones in different shapes and sizes. 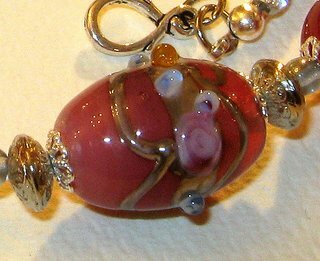 On this necklace, I have used again 1 fioratto focal bead (the oval one) and 2 fioratto tubes, as it happened in the Serenissima one . I called it Giardino, for obvious reasons! I also used antique Czech seed beads (in pink), some Swarovski bicones in peach/champagne, Swarovski crystal pearls in Rosaline, Czech glass beads (leaf, tulip and oval shapes) and poilshed rose quartz beads, besides the usual gold-plated spacers, caps and clasps. 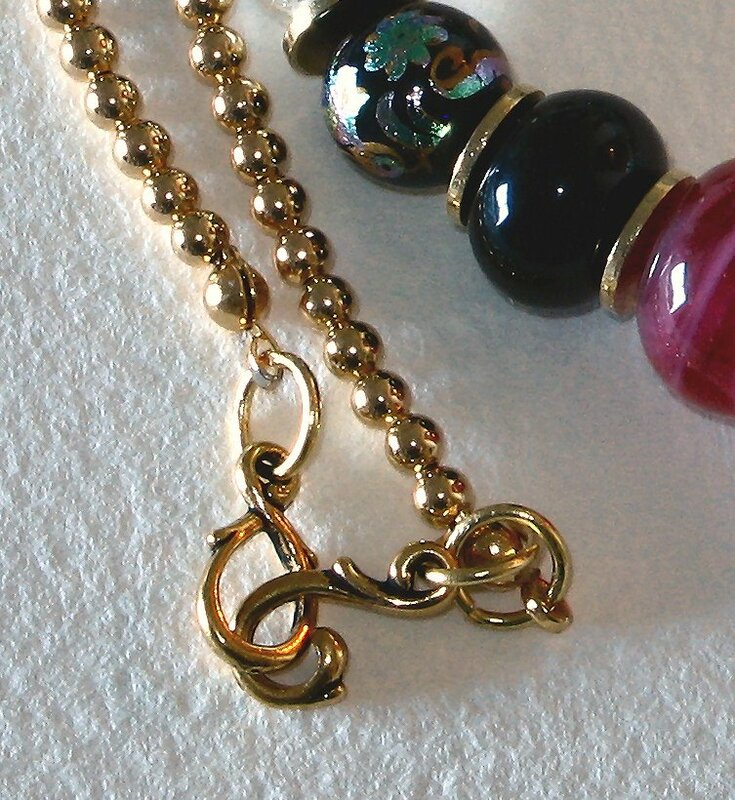 Focal bead, Swarovski bicones & Rosaline pearls. Fioratto tube beads & Rosaline pearls. I made two necklaces this afternoon. 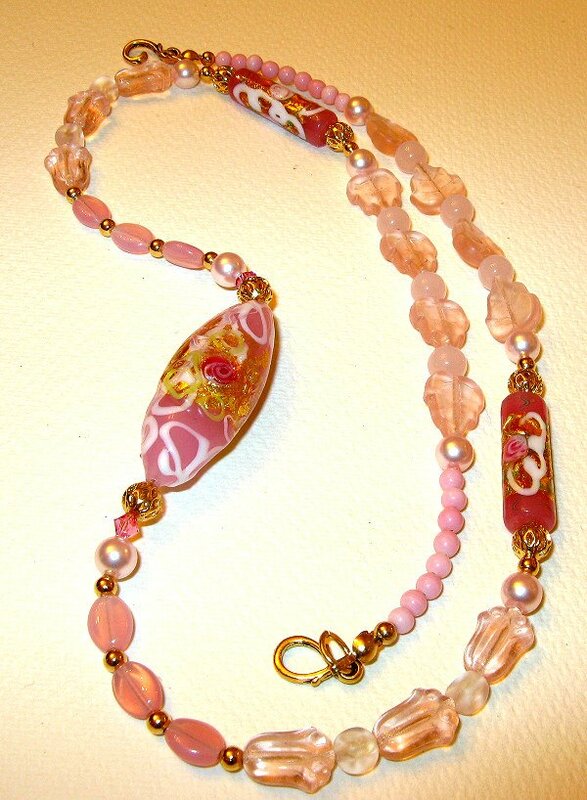 All in shades of pink, and mostly due to my Mother's request. I hope she will enjoy them. 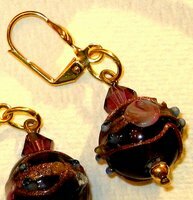 Besides the Murano beads, I also used some antiqued glass pearls, gold-plated caps, 2 tiny Swarovski bicones and the usual gold-plated beads. 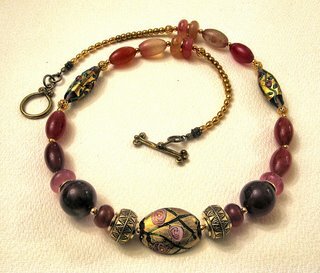 The second necklace I will still photograph and post it tomorrow! 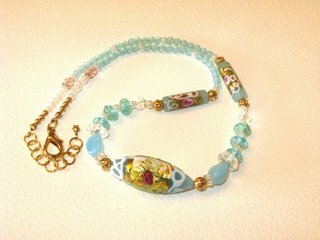 Yesterday, I have finished my blue necklace. 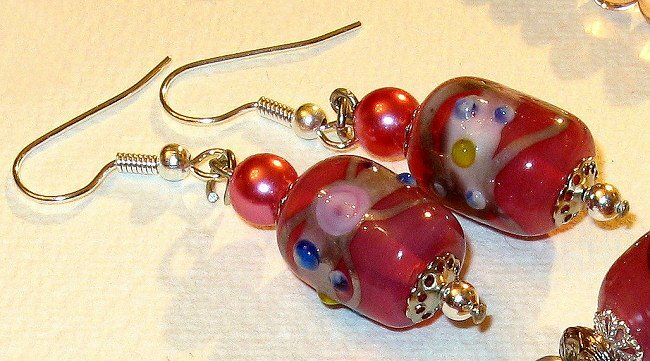 I decided to call it Serenissima, as a little tribute to Venice - where Murano is, and all those beautiful glasses come from. "Serenissima" means "the most serene" and refers to the title given to the republic of Venice - La Serenissima - which lasted over a thousand years (until the end of the XVIIIth century, precisely). 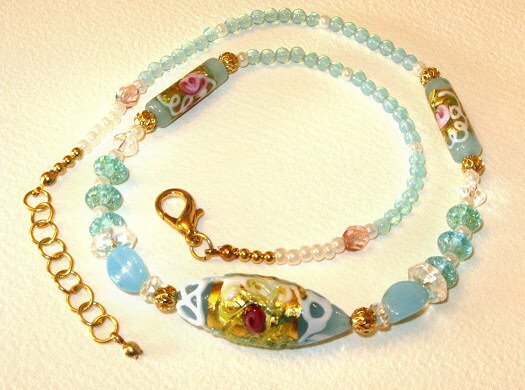 I used blue beads, trying to imagine Venice on a crisp sunny day, surrounded by the waters and the sun light reflecting on its surface and on the glass. This necklace is shorter than the previous ones, thus, I made a little extension chain with some links I have here and one knot cover. I will have to replace it for the links are a bit big, and I also want to add a tiny bead to it. 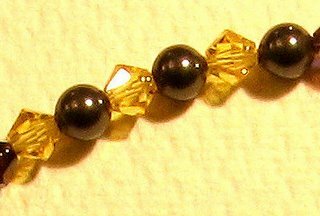 I only had links on that size, and also did not have any golden pins to make the bead, but I am going to buy some on Saturday, hopefully! 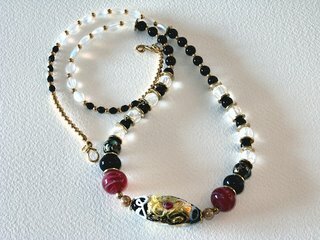 And, finally, another view here - I love "rolling" the necklaces when taking pics! It was very hard to make it. Mostly because I firtsly threaded it with a silk cord. 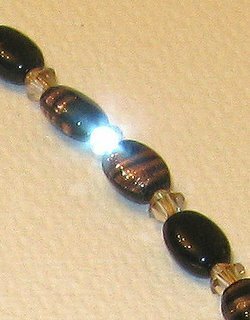 It turns out that I had to redo everything because I missed one or two black beads and then the cord ended up too short, and so on. 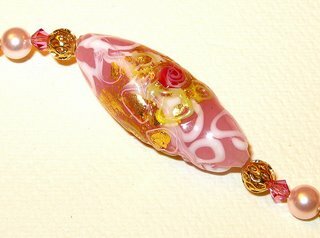 Also, it is hard to thread with silk since it is too soft and you need to use a needle. 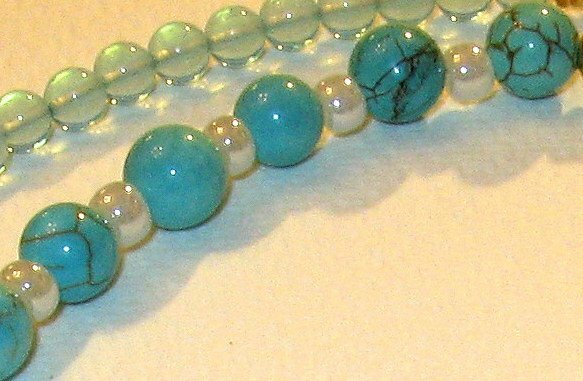 But that's not quite the problem: due to the friction of the beads, the cord may end up frailed, and the fibers start to unravel. A pain. That's why I decided to do it again with a nylon wire - as it's usually done, it seems! 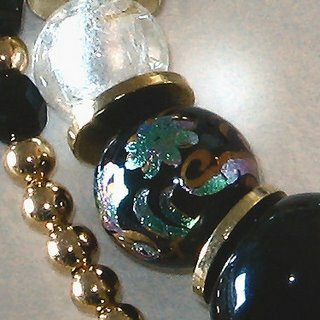 The above is the focal bead, a wedding cake Murano in black, really big and pretty. The ones beside it are the cherries! 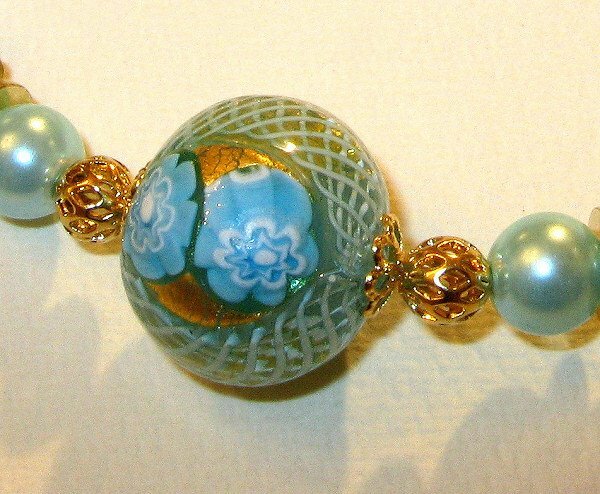 This is a Japanese Tensha bead, which is made of acrylic and has a lovely shiny design with a floral motif. 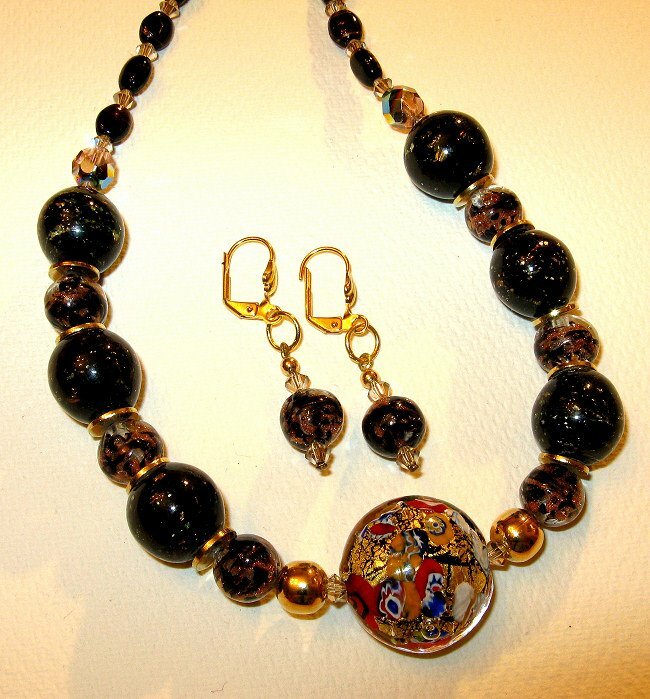 They surround the medium Murano beads and the cherries. 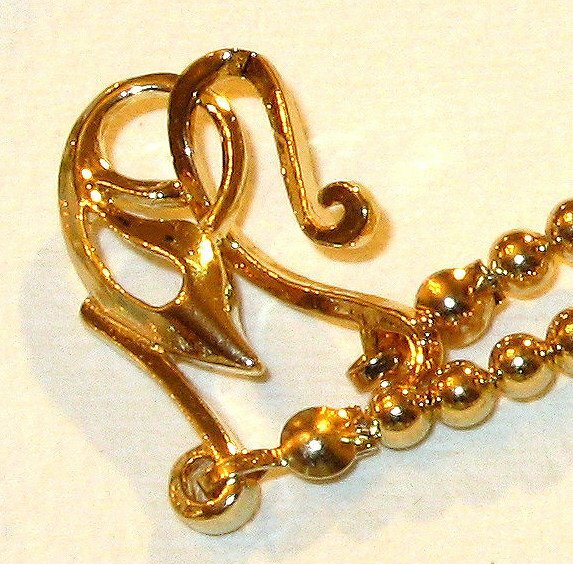 The clasp is a small toggle one, gold-plated. - Gold-plated toggle, spacers and discs.